This is a repeat of Desert Storm where the initial incarnation of the Patriot claimed success and alter analysis showed that it never hit its intended target. This is just silly media bs. Patriot PAC-3 actually works well most of the time, but apparently its far more interesting to focus on one potential failure. The media just loves bashing missile defense. The Yemeni Army’s Rocket Battalion launched three or four new ballistic missiles at their Saudi oppressors yesterday which they claimed hit their targets at the military base outside Khamis Mushayt, and is what regional press are reporting. However, the Saudis claim to have intercepted four targets. The Yemen video release of the new Qaher-M2 medium-ranged BM only shows three launches. Perhaps it was only three, but the Saudis launched six just to be safe. The video of the Qaher-M2 launches were easy enough to find. But I had to scour for some time through some twitter and youtube members in a language with funny letters that I do not understand (probably Arabic) to find the video of the Patriot defense in action, which originated on reddit. Video shows what is clearly at least one direct interception. Now the bad news, thats the only surviving video. There were three others including the attack launch site, but the Ministry of Truth Global Engagement Center and NDAA 2017 decided those documentations no longer needed to exist. Its probably still around, but you would have to go searching with translated foreign text to find it. Im tired of doing that, nobody seemed to care when I did, and it hurts my brain to try and make sense of so many squiggly lines. # may as well be hieroglyphs, at least many of those are self explanatory. edit on 12-10-2017 by worldstarcountry because: oh whoops, that was March of this year, only nine months ago. Well well, thats quite an interesting twitter account. I will be adding it to my sources. 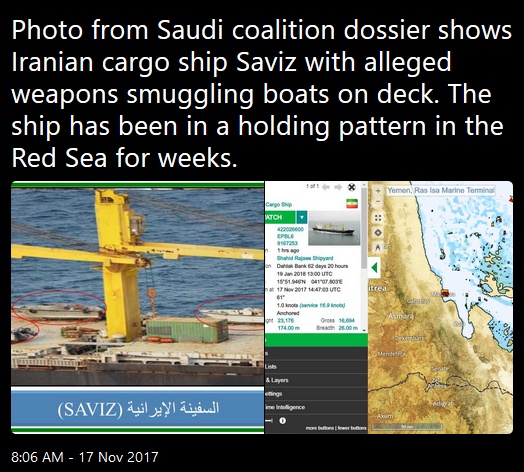 Looks like there is some possible evidence there of Iranian weapons smuggling into Yemen, as is pretty much known. But it is interesting to catch it on photos. The dossier also includes a photo purportedly showing Iranian military personnel on another Iranian cargo ship. Yeah he posts some interesting stuff. Seems pretty pro Saudi, but Its nice to get all sides etc. When I saw the yahoo comments section on this, there were a few people saying that the system was never designed to take out the kind of missle they were aiming to hit - it wasnt fast enough. Many said that only the THAAD system would take it out. In this I am inclined to believe the comments because the patriots are an old system even if there may or may not have been some upgrades over the years.